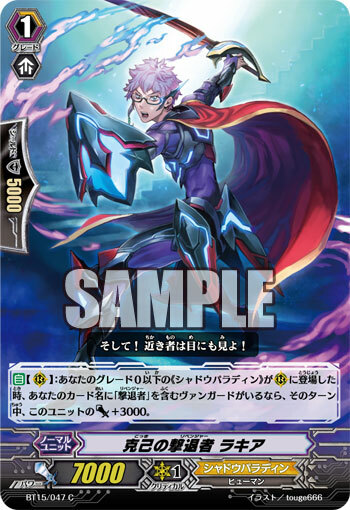 [AUTO](RC):When a grade 0 or less «Shadow Paladin» is placed on your (RC), if you have a vanguard with "Revenger" in its card name, this unit gets [Power]+3000 until end of turn. 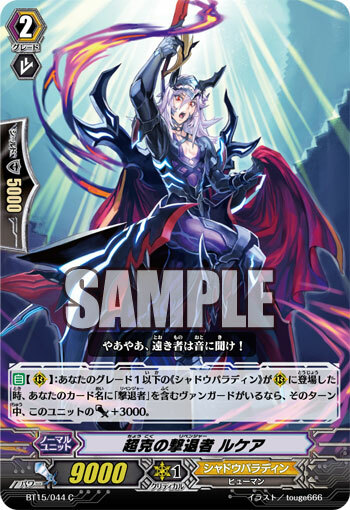 [AUTO](RC):When a grade 1 or less «Shadow Paladin» is placed on your (RC), if you have a vanguard with "Revenger" in its card name, this unit gets [Power]+3000 until end of turn. Conquering Revenger, Luther: "Hey hey, my name is known far and wide!" Self-Control Revenger, Lucia: "And! Feast upon me with your eyes!" Warriors of the “Revengers” who have sworn an oath to protect the Sanctuary from the clutches of the Invaders. They’re a pair of oddballs among the Shadow Paladins who have a unique sense of aesthetics, who always introduce themselves with a perfectly synced speech, and have been getting along long since before the war. Luther is the son of a knight’s family, despite being the child at the foot of the table, while Lucia is the son of a family of scholars. However, the two of them have been the best of friends since they were young, and yearned to protect Cray just like the heroes from their storybooks, wishing to become just like them one day. However, when the world wasn’t in the middle of a crisis, they self-centeredly started their own disasters and ended up being the victims of robbers from lands beyond the Sanctuary. They long since burnt the bridges with their hometowns and could no longer ask their families for help. But at their time, they were saved from the robbers by a knight dressed in black armor. After that, they chased after the mysterious knight who disappeared before they had a chance to thank him, in vain for years. But eventually they ended up in the “Shadow Paladins” that the knight belonged to. But they still do not know who that knight was. Of course that’s naturally as they didn’t have a chance to remember the knight’s face. But they’re not terribly upset over not being able to thank the one that saved them. Because when they feel sad, they just introduce themselves in a ridiculously pretentious manner.